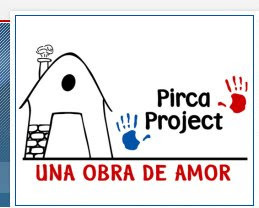 Welcome to Pirca. Driving down the switchbacks from the main road is a little scary, but well worth it. As you turn the last bend the people have built an archway of tree limbs and freshly picked flowers. Visitors to the village are greeted as distinguished guests. Not exactly an expensive instrument, but Angelino makes a pretty good sound considering. Even Rick from the Benson Institute can't escape the dancers. The village as it appears from our campsite up the mountain. This picture was taken on a visit during the rainy season (February), you can tell how lush and green it gets. 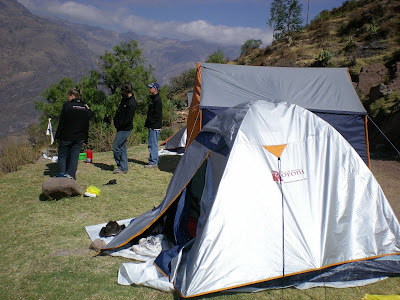 Javier runs a travel service that also outfits hikes of the "Inca Trail," so you don't have to worry about the gear. He has great tents with air matresses and warm sleeping bags. We set up camp along the ridge above the village. This is what camp looks like from the village. You can see the specs on the mountains. That is our tents. It's not exactly primitive camping. Javier hires his "Inca Trail" cooks to come along and prepare meals that are served in the dining tent. Very uptown! They provide a variety of food. 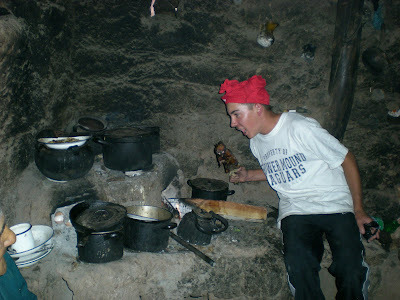 Or if you have an iron stomach like Sam, you can try a little of the local fare, roasted cui (guinea pig), YUM! More than anything you will enjoy the company of the wonderful children of the village that will fill the camp with laughter and excitement. Just ask Heather and Alyssa.